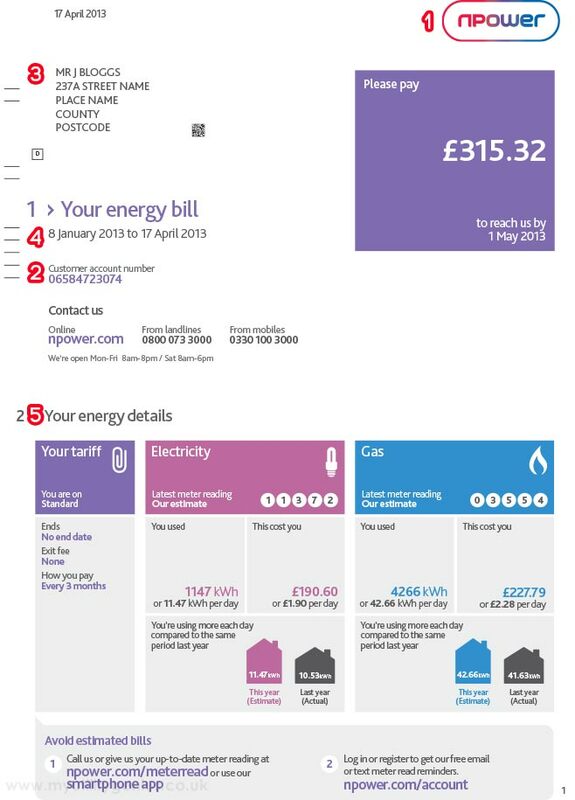 Have you ever looked at your Npower bill and thought that it was far too complicated? Many customers have had the same thought. This guide aims to demystify your Npower bill, so you can make informed decisions about your power and translate any jargon in the future. 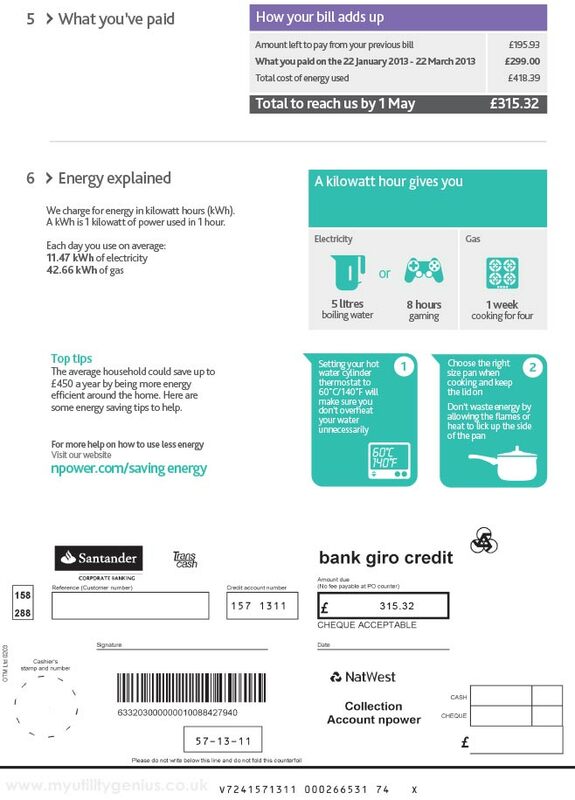 The first page of your Npower bill contains most of the critical information about your bill. To start with, let’s take a look at the top half of the page you can see to the left. 1. In the top right-hand corner, you can see the logo for Npower. This tells you who your energy supplier is which can be handy if you have forgotten or just moved into the property. 2, 3, 4. These parts consist of information about your details, e.g. where you live and so forth, as well as essential information about your energy bills. You can see the period of your billing, in this instance, it was the 8th of January to the 17th of April. Underneath, you can find your customer account number which is an excellent piece of information to use when you need to get in touch with your supplier. It helps them find your account details so they can fix any problems should you run into any with your supply. The contact information below that will tell you how you can contact your current energy supplier. It should also tell you what times you can get in touch, for instance from 8 am to 8 pm. 5. 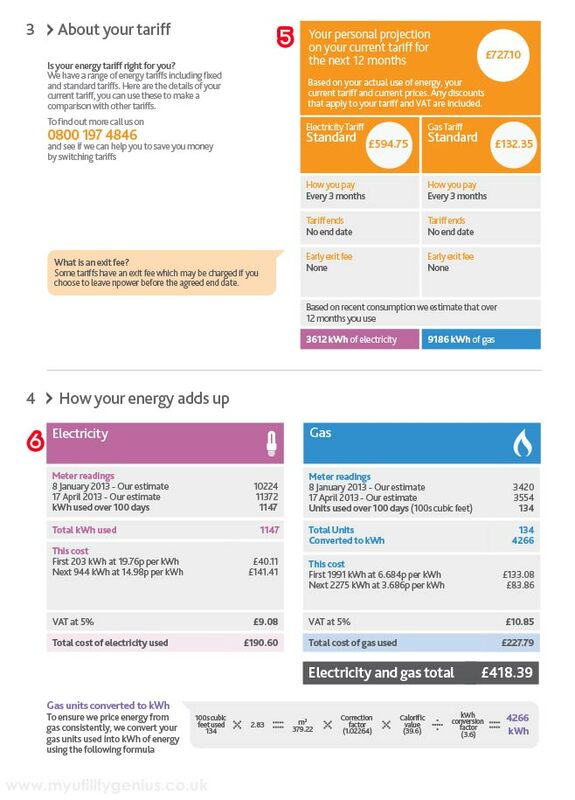 The bottom half of the first page of your energy bill will show you which tariff you’re on, how much your electricity has cost you, your gas prices and a breakdown of how your usage compares to the last year. Knowing which tariff you’re on is the most helpful information you can have when it comes to switching energy supplier. It allows you to see what the name of your current tariff is, which can tell you what type of tariff you’re on when your contract ends and any exit fees you might incur from trying to switch early. If you’re on a fixed rate tariff, it means that your energy prices are set. This is usually for a certain length of time like a year or two. On the other hand, a variable rate tariff means that your energy costs will depend on the open market. These costs can be affected by politics, the time of year and other current events. Usually, a variable rate tariff is more expensive than being on a fixed rate tariff, so if you see that you are on a variable tariff, you should try and switch immediately. The section that tells you when your contract ends gives you the opportunity to see when you could switch energy suppliers. Sometimes, when you end a fixed rate contract, your supplier will move you onto their more expensive variable rate. That’s why it’s important to check your contract end date so you can prepare and switch to a more cost-effective deal. Your supplier should notify you 42 to 49 days before your contract ends. During this time, you can switch energy suppliers without paying any exit fees. Exit fees aren’t usually applicable for variable rate tariffs, so you can switch at any time without incurring a charge. However, for fixed-rate tariffs, you’ll often find that there are exit fees attached should you try and switch before the switching window. The comparison information shows you how much energy you used last year compared to this year, which can help you see how your consumption habits are affecting your costs. At the very bottom of the page, you’ll probably see some encouragement to submit meter readings. This is important because submitting accurate meter readings can make sure that you pay the right amount for your energy, and you can avoid under or overpaying. This was created by Ofgem to try and make it easier for customers to compare energy suppliers by offering you an opportunity to see what your costs will likely be over the next 12 months. You can take this information regarding the costs, then use a comparison tool like the one at the top of the page to find out how much you could be saving. It will also tell you how you pay, which is every three months in this example, as well as a refresher of when your tariff is going to end. Remember, your tariff end date is important when deciding whether to switch energy suppliers and when. 6. Here, you can see how your energy adds up regarding your electricity and your gas. For instance, in this example, you can see that your meter readings show estimates of how much energy you have used. An estimate means that this isn’t exact information, it’s just what your energy supplier assumes you used likely based on your past consumption. This can lead to being over or under charged for your energy, which can lead to things such as backbilling. You can see a breakdown of the costs which in this case was calculated by how many units of kWh you used at a certain price, then VAT and the total at the bottom. The third page of your Npower bill will contain information regarding what you’ve paid, including any costs you might have left to pay from your previous statement. This is also known as ‘debit’, which is sometimes confusing especially when being ‘in credit’ means that your energy supplier owes you and not the other way around. Next, you can see a section that mentions how they charge you like how much a kWh is. You can also see what a kilowatt hour can give you, for instance, a one-kilowatt hour will give you 5 litres of boiling water, 8 hours of gaming or 1 week of cooking for four. This gives you a good idea of what each of your activities might be costing you and why. It can also be great regarding learning to save energy where possible. The last and final page of your bill will tell you where you can get help in certain situations. For instance, it offers you a way to find some independent advice for your energy like The Citizen’s Advice consumer service. It also encourages you to ask Npower for any extra help you might need paying your bills, like getting help managing your costs or getting the warm home discount. 2, 7, 8. Your customer account number, electricity meter number and gas meter number are sometimes useful for switching suppliers. 10. 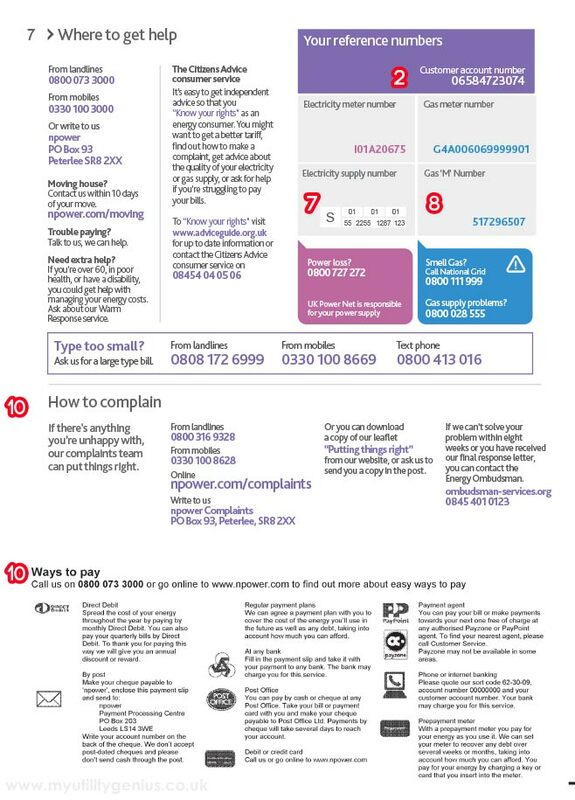 The last section of your Npower bill will tell you everything you need to know regarding how to contact Npower about a complaint. And, how you can pay. For instance, you can pay by direct debit, by post, post office and debit or credit card.